In this “political” year with Congressional mid-term elections in November, including many hotly contested races for seats in the US House of Representatives and the Senate, as well as many state and local elections, I receive many questions from broadcasters across the country. Perhaps the area in which most questions are received deals with the “political file,” particularly because these files are now available online. The fact that this file can now be viewed by anyone anywhere across the country has raised many questions that were perhaps less top of mind when the file was available only by physically visiting the main studio of a broadcast station. So, with the election just over a month away, meaning that the busiest advertising period will be coming up between now and the election, I thought that it would be worth taking a look at some of the online public file issues. As an initial matter, it is worth mentioning that the political file has two main purposes. First, it is designed to provide information to the public about who is trying to convince them to vote in a certain way or to take action on other political issues that may be facing their country or community. Second, the file is to inform one candidate of what uses of broadcast stations his or her opponents are making. Thus, the documents placed in the file must be kept in the file for only two years from the date that they were created – perhaps on the assumption that at that point, we will be on to the next election cycle and old documents really won’t matter to the public or to competing candidates in the last election. But what needs to go into the file? The name of the candidate and his or her authorized committee, and the treasurer of the committee. All information should go into the file as soon as an order is received – certainly within 24 hours. The only exception is for the details of the exact times that the spots ran, which can be inserted into the file when your traffic system generates those reports – provided that they must be provided sooner on request. Any national legislative issue of public importance (e.g., an ad saying “write your Congressman and tell him to vote” for or against some issue being dealt with by the Federal government). In the political file for these Federal issue ads, in addition to all of the information for candidate ads, the file also needs to include a description of the issue that the ad addresses. That can be the name of the candidate that the ad supports or attacks, or the name of a Federal issue that the ad addresses. In some cases the ad can address both a candidate and an issue. In that case, it is probably safest for the political file to list both the candidate and the issues addressed. The FCC’s Media Bureau issued a decision in January 2017 requiring that dual identification (see our article here), but that decision was withdrawn when the current FCC Chairman came into office with a promise that the FCC would reexamine the issue and release a new decision (see our article here). While that new order has apparently been drafted and has been on circulation among the Commissioners for a vote since May 2018, the decision has not yet been released. Watch for a clarification that could come at any time. A list of the chief executive officers, members of the executive committee or of the board of directors of such entity. In the decision referenced above on which we are awaiting a final FCC ruling, the Media Bureau had required that stations, if they are given only a single name of an officer or director of an entity buying issue ads, ask the ad buyer for the names of additional officers or directors – on the assumption that it is unlikely that any organization has but a single officer or director. While that responsibility has not yet been clarified, it is probably advisable that stations make such inquiries. We note that many stations use forms to gather the information necessary to respond to these questions – often forms generated by a group owner or one of the “PB” forms created by the NAB. These are good models to use to gather the information for the file, but the station still needs to make sure that the information provided by the political buyer fully responds to the questions on the form. We have heard of many cases where non-candidate groups do not want to say on the form that they are buying ads on a Federal issue, even when they are clearly attacking a candidate for Federal office, perhaps because they do not want all the information about the advertising buy (including the price and schedule) to be revealed in the public file. Stations need to inquire if the information provided is not complete, as the burden is on the station, not the ad buyer, for this information to be complete and accurate, and timely placed in the online public file. Also, do not put information into the file about the method of payment for the ads. We have seen cases where checks from advertisers, or worse yet, information about their electronic payment methods, have been included in the public file, potentially revealing sensitive information that could compromise bank accounts. Do not place this information into the file. Finally, be alert to state record-keeping requirements. States including Washington and New York have recently enacted state laws that may impose different or additional paperwork obligations on political advertising (see our article here). If your station is in one of those states, be sure to not only observe the FCC’s rules, but also those of the state in which you are located. Good luck in keeping all these rules straight in the last weeks before the election. For more information about political advertising obligations, see our Guide to Political Broadcasting, here. And, of course, ask your own lawyer as these issues arise, as they raise many tricky issues that may depend on the specific facts of your case to get the right answer. 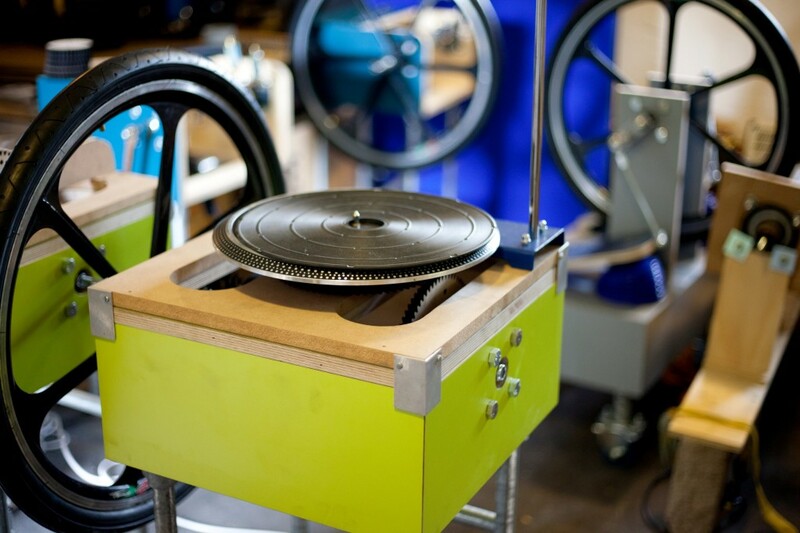 What if music were made mechanically, with giant wheels and bellows and valves? The Mammoth Beat Organ makes that happen, using parts from toilets, a hearse, and a treadmill. It’s the Dunning Underwood Mammoth Beat Organ, the creation of two wild musical minds – Sam Underwood and Graham Dunning – in their first collaboration. It has the sonic thinking of the Giant Feedback Organ (Underwood) and the mechanical performance approach of Mechanical Techno (Dunning). And accordingly, it’s even meant to be a two-player contraction, involving both artists. That performance spectacle is really part of the magic, as components are wheeled around and bits and bobs added and subtracted. Having seen Graham’s live show, that performance energy drives things in a way different than you’d get from just an installation – it has improvisation in it. This project is just getting going, so it’ll be fun to watch it evolve – especially if we get to see it in person. It’s worth noting that they talk about the need to have years and years to continue building and rehearsing with the invention. We of course value novelty in tech, but that’s telling, whatever your fantasies are (whether large and mechanical or compact and digital or anything else). 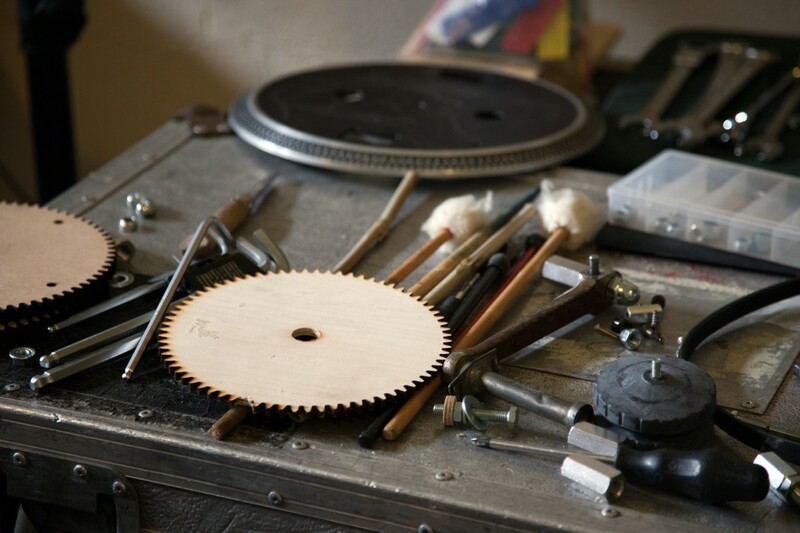 So I do hope they’ll keep us posted as they continue developing, and as they use this instrument to spark new creative directions in their own imaginations. I’m not a fan of YouTube and the next videos it plays, but following this with Sir Simon Rattle conducting Chariots of Fire with Mr. Bean sure as hell works. In case you need some motivation for today’s soldering / hammering DIY instruments, have at it. 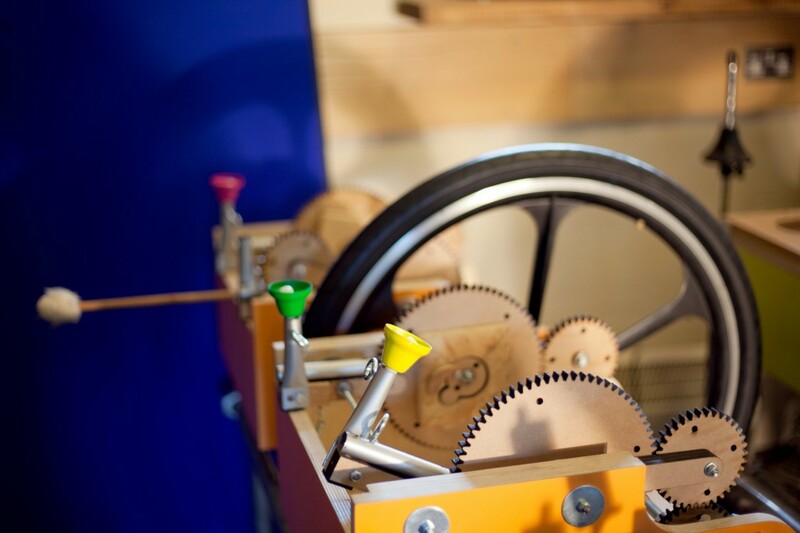 The post Mammoth Beat Organ is a giant crazy mechanical music machine appeared first on CDM Create Digital Music. The post These Photos Will Take You Inside Our Epic Festival In Warsaw Last Weekend appeared first on Telekom Electronic Beats. A monstrous love song inspired by retro novelty rock that channels classic Halloween hits by way of Nick Cave and PJ Harvey! The post Marie Davidson Talks Touring, Psychology And The Power Of Not Caring appeared first on Telekom Electronic Beats. Ryoji Ikeda has waited patiently for the future to catch up with him. Since his 2005 album Dataplex, the Japanese composer and visual artist has explored the dazzlement and darkness of our digital age in electronic works that are partly generated by algorithms and blur the border between music and maths. Performing behind a wall of intense 3D light patterns, his hour-long composition Datamatics [ver 2.0] – reworked from a piece that debuted shortly after Dataplex – packs an even heavier punch in 2018 than on its first unveiling in 2008. It’s called the Moog One but think 8- or 16-voice synth. And this is the “dream” analog synth in that it’s a luxury instrument, running up to US$7999 for the 16-voice model. US-based retailer Sweetwater appears to get the scoop on this one. The big deal here: advanced envelopes, a deep, no-compromise architecture with two filters per voice and four LFOs, and features like routable ring modulation, oscillator Frequency Modulation, and hard sync. It’s also loaded up with I/O, both audio (including inserts for effects) and control voltage/gate. There’s even a LAN port that promises future expansion. The Moog One is also a kind of high-end successor to the Minimoog Voyager, with an emphasis on live performance features (including a feature called User Spaces for storing and recalling settings), the return of the X/Y pad, and an insane amount of hands-on control – 73 knobs and 144 buttons. And while we’re waiting on photos, the side panels are made from ash and the front panel from aluminum, plus it does look nice in this one cropped shot. And here are those specs. 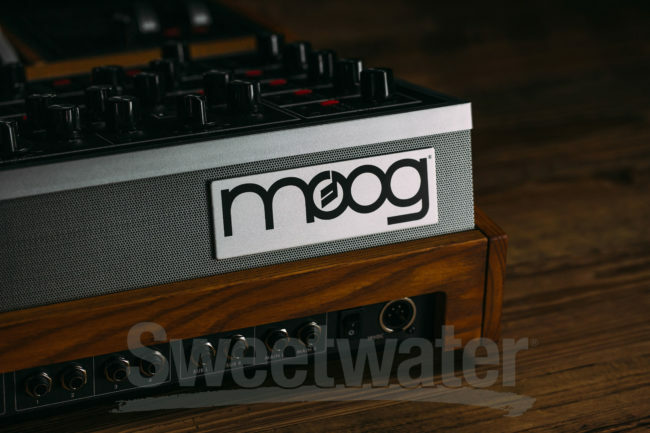 So we expect the usual attention to detail and find craft from Moog, if at a premium price above even the majority of boutique makers in this sector – US$5999 for 8-voice, 7999 for 16-voice. It’s available now in the USA from Sweetwater (they even say “in stock” as I write this, even though there hasn’t been a formal public announcement yet). Now we just need a big poster to hang over our beds, maybe – well, and to hear what it sounds like. Stay tuned. But yeah, for the rest of us, you have other options from the likes of Dave Smith, Waldorf, and of course monosynths from Moog. So this will mainly be about curiosity as to what a polysynth can do when it’s positioned as a fully premium electronic instrument. The post New Moog One polysynth costs US$5999-7999, available now appeared first on CDM Create Digital Music.